Together with his wife and son. 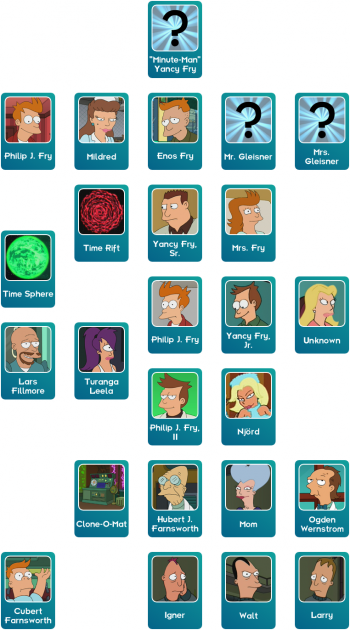 Yancy Fry Jr. (born c. 1971) is the elder son of Yancy Fry Sr. and Mrs. Fry, and brother to Philip J. Fry. Yancy frequently belittled his three years younger brother Philip from birth, partly because of the attention their parents spent on their new baby instead of him, and partly because he wanted his brother's name instead of his own. In their teens, Philip was talented at both basketball and break dancing, while Yancy was always mediocre. Due to jealousy, Yancy would steal Philip's original moves and claim them as his own. After his brother found a seven-leaf clover and succeeded in pulling off an impossible move, Yancy tried to steal the clover, forcing Philip to hide it in his Ronco Record Vault. On 1 January, 2000, Yancy's brother goes missing. Unbeknown to the family, he has accidentally been frozen. While his parents seem neutral to the disappearance, Yancy was surprisingly more concerned. After finally giving up the search, he continued his life. Before Yancy's wedding several years later, while looking for records in Philip's old Ronco Vault, he found the seven-leaf clover, but decided not to use it, but keep it as a reminder of his brother. When his wife gave birth to a child, they agreed to name him Philip J. Fry after his brother, and Yancy gave him Philip's old seven leaf clover, thus ensuring his future success. Yancy's son did grow up with great luck, and, among other accomplishments, had a series of hit songs with his band Leaf Seven, and was the first man to walk on Mars. Yancy's brother woke up from the accidental freezing a thousand years later, long after Yancy had passed on. After finding a statue in the ruins of Old New York with his (and his nephew's) name on it three years after the freezing, he believed that Yancy had stolen his clover and his life, and he planned to rob his brother's grave of the clover, which he had been buried with. Reaching the grave, however, he realized that it was of his nephew and not his brother, and he left the clover there. These events were slightly altered when time paradox created a duplicate of Philip J. Fry I which lived for another twelve years in the 21st century after the original Philip was frozen before going missing again. However, despite his brother technically not being frozen, Yancy still named his son after him. Cubert Farnsworth - the Professor's clone/"distant great-grandson"
Yancy at three years of age, with his then newborn younger brother Philip (3ACV04). Yancy (right) in his teenage years, playing basketball with Philip (3ACV04). Yancy with his son, Philip J. Fry, II, named after Yancy's brother (3ACV04). Because his 3 year-old self was voiced by Lauren Tom in "The Luck of the Fryrish", he is one among few Futurama male characters to be voiced by a woman. This page was last edited on 13 September 2017, at 20:39.